Last year I contributed to a crowd sourced book of HR blogs, all written specially for the occasion by over 50 bloggers. This year, courtesy of David D’Souza, we are doing it all again. This time over 70 people have contributed a series of superb posts covering every HR and management angle imaginable. I have only just started to read it and there are some cracking contributions again. 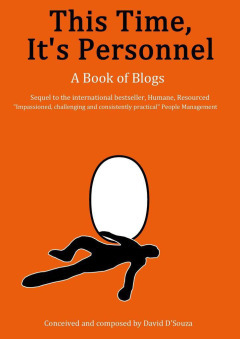 Humane, Resourced: A Book of Blogs was an Amazon best seller and A Book of Blogs 2: This Time, It’s Personnel has just hit the virtual bookshelves. This time there are a handful of NZ bloggers. My own post covers my murky past as a public servant in London and some of the HR tricks we used to get up to. It’s not for the fainthearted. Unlike last year, I am not reproducing it here. If you want to read it get yourself over to Amazon and download the book. It costs about the same as a damn fine cup of coffee and is more tasty than a piece of cherry pie (if you want the full Twin Peaks reference). Oh, and the proceeds go to charity again. If you are reading this post, you should be reading that so don’t waste any more time. Go on, what are you waiting for? Reblogged this on Mark Gilligan Down to Earth H.R. Disruption – rad, fad or friction?